Revising the Eichmann trial...and Hannah Arendt's coverage of it. On May 11, 1960, the man who had been living in Argentina under the name Ricardo Klement was coming home from his job at the Mercedes-Benz plant when he was abducted by two Israeli operatives. “What’s your name?” they asked him. “Ricardo Klement,” he answered. The next time he was asked, he offered up the name Otto Heninger, a false identity he’d used in the past. The third time, he told the truth: He was Adolf Eichmann. One of the most elusive participants in the Final Solution was finally in custody. 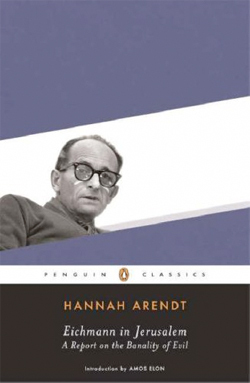 Eichmann in Jerusalem: A Report on the Banality of Evil by Hannah Arendt. 336 pages. Penguin Classics. $16.